The Great Fastback Epoch swept across America like so many sudden feverish automotive (and food) fads, unleashed by the 1963 Sting Ray. Some were good, like the Corvette; others middling. But way too many were atrocious like the Marlin, rushed attempts to graft a fastback roof on a sedan body, a recipe with very poor odds of success. American fastbacks too often were like American pizza: an over-sized and over-laden pathetic imitation of the original. Well, the Italians had a head start, and for them fastbacks were hardly a new fad, but a staple of their automotive diet; one they had long perfected. A very tasty example of that is this delectable Fiat Dino GT Coupe, whipped up by the master fastback chef himself, Giorgetto Giugiaro. 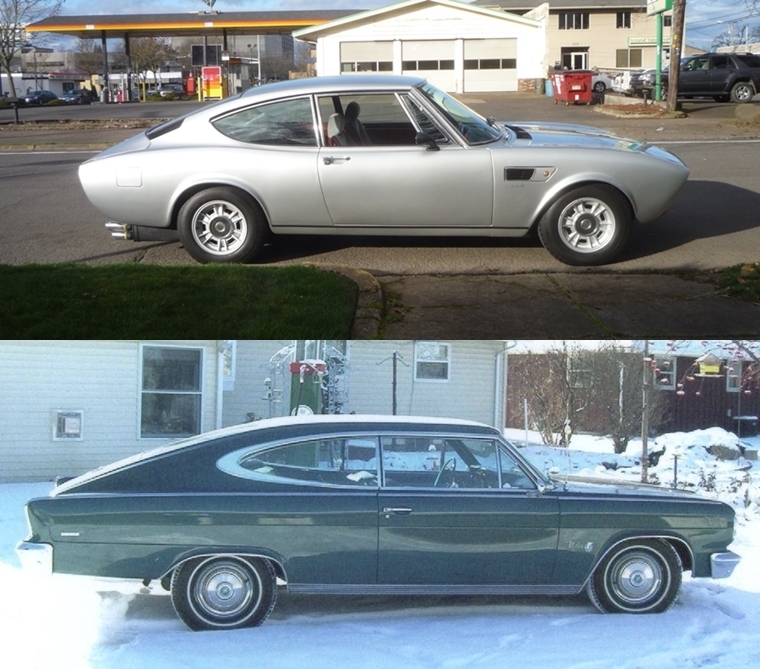 These cars make an interesting comparison on a number of criteria, but let’s start with the fact that both of them were germinated and birthed about the same time, the Marlin (CC here) arriving in ’65 and the Fiat Dino GT in ’67. On second thought, let’s end this exercise right there, and move on, because these cars really have no basis for comparison, except to explain to folks who think I’m overly harsh on the Marlin’s styling. I sure wasn’t eating genuine Neapolitan wood-fire cooked pizza in Towson in 1967, but I was savoring the visual delights coming from Italy at the time, and they rather spoiled me for the Detroit (or Kenosha) imitations. 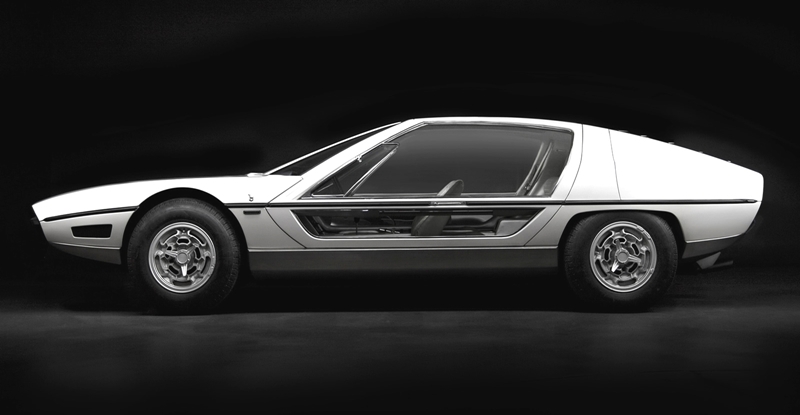 The 1967 Lamborghini Marzal by Marcello Gandini of Bertone was my lust object that year. Sorry, Marlin and company. 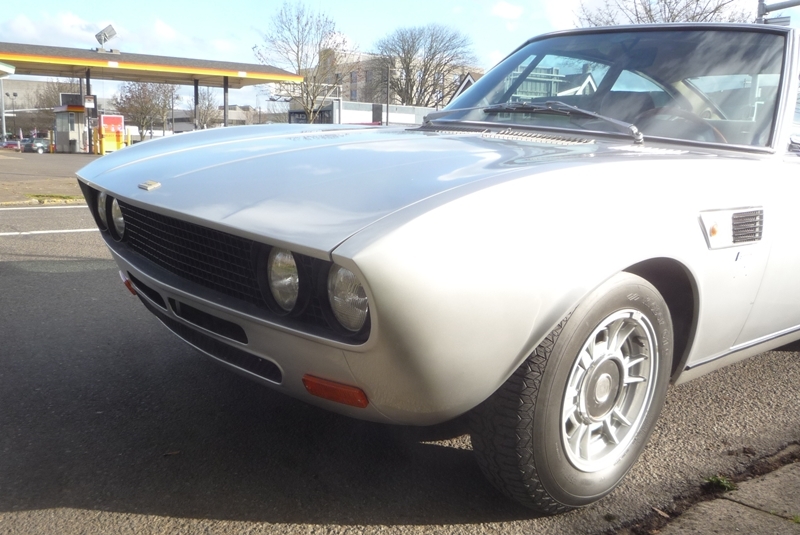 The Fiat Dino GT came out of the same Bertone studios as the Marzal that year, although by different hands. But the fact that Gandini and Giugiaro were both working under the same roof then was apparent in their rooflines. Obviously, the Marzal was a show car, although it was realized quite faithfully in the Espada, except the glass doors of course. while Pininfarina was given the contract for Spider. Which explains why they look nothing alike. In a way, just explaining the existence and provenance of either of these cars is not totally simple, but then that can be the Italian way. These cars, along with the legendary Dino 206 GT were intended to be part of a new “Dino” brand; below Ferrari and above Fiat. One of the reasons for the Fiat versions was to have a larger base of cars to install the 2.0 L V6 in order to homologate it for Formula 2. The branding plan died largely at the hands of American Ferrari dealers who didn’t want to sully the Ferrari brand equity and/or have “Fiats” sully their showrooms. 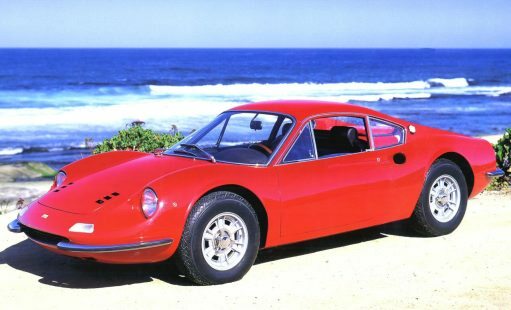 So the Dino 206 GT was essentially sold as a Ferrari, but without the actual name on it (most have had it added), and the Coupe and Spider arrived as Fiats, although with the exact same genuine Ferrari-built engine and other components. In fact, the later 2.4 liter version, of which this car is one of, were actually assembled in Maranello alongside genuine Ferraris, after the bodies were shipped there from Bertone and Pininfarina. Which helps explain why so many owners of these cars re-badged them as Ferraris. 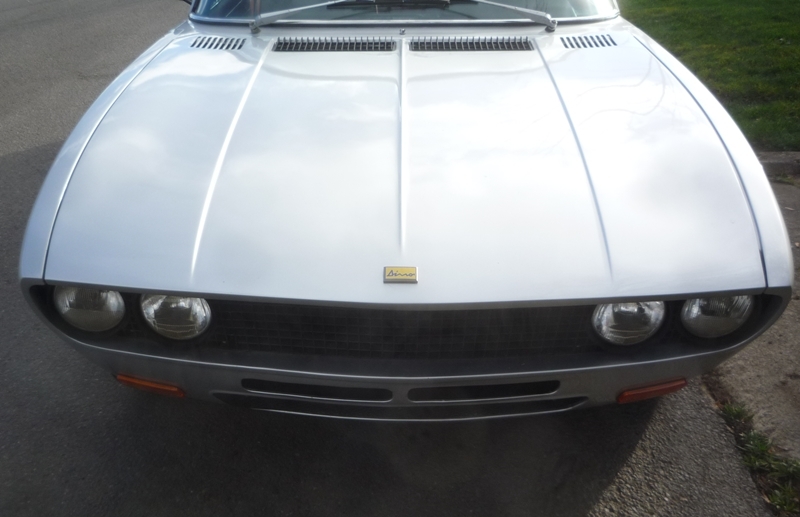 This coupe sported a full set of Ferrari badges and emblems, replacing all the Fiat markings. It is being re-branded as a Fiat, to prepare it for its sale, which happened shortly after I shot it. A rather pathetic bit of insecurity, but then Fiat’s brand name has been anything but associated with finer and more expensive cars in the US, unlike in Europe. This car is also missing its original bumpers. I will grant that the Marlin was undoubtedly the roomier of the two. 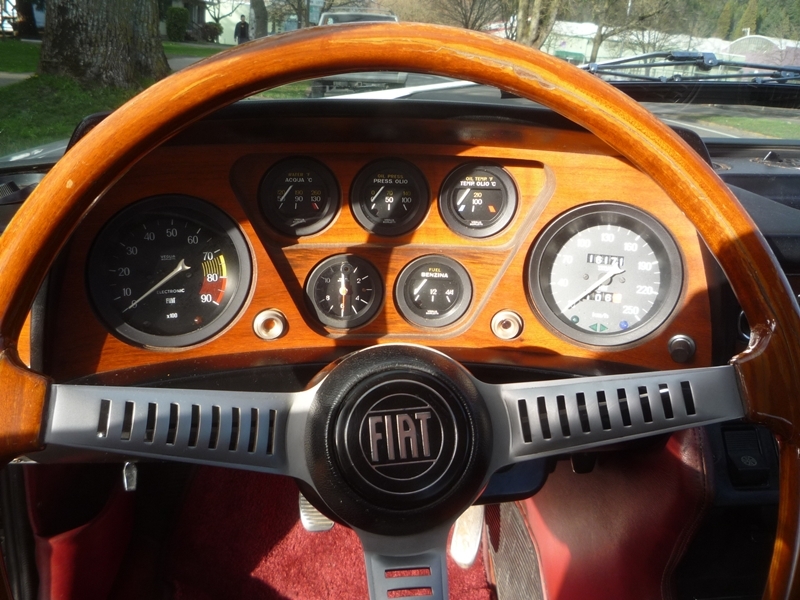 My efforts to slip behind the wheel and get comfortable were stymied by the steering wheel’s typical old-school Italian position very close to the dash, which with the seat slid way back, made it a very distant object, and one that also crimped my leg against the console. Roy Abernathy would not have been pleased, never mind the much more cozy rear seats. 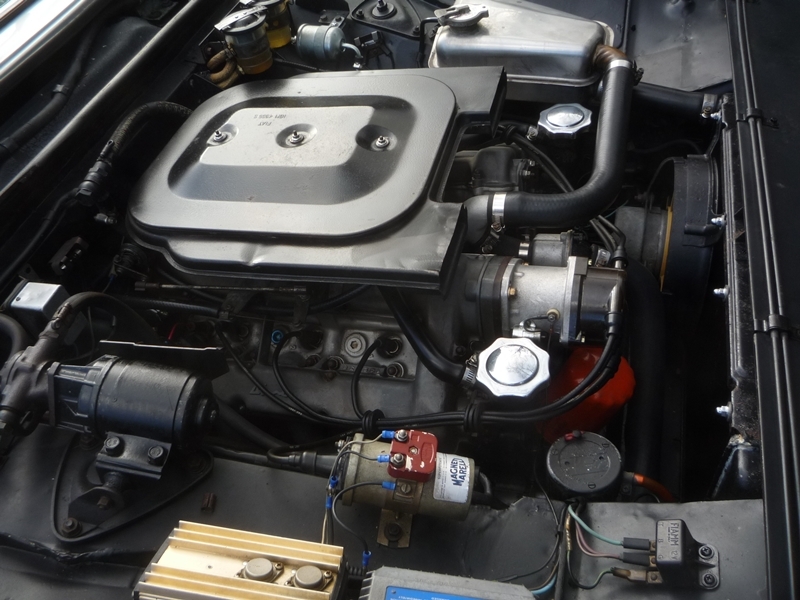 The DOHC alloy V6 that motivates these cars is a delectable piece of Italian alloy-ware, and its habits are easily discerned just by a glance at the tach: the red zone begins at 8,000 rpm. In today’s world, not that impressive; in 1966, that was quite likely the highest of any production car engine in the world. It starts with the snarl of a cornered small mammal with teeth, and the obligatory blipping of the six Weber throttle plates brings all kinds of lovely nervous crescendos from the Abarth exhausts. A high strung creature indeed. 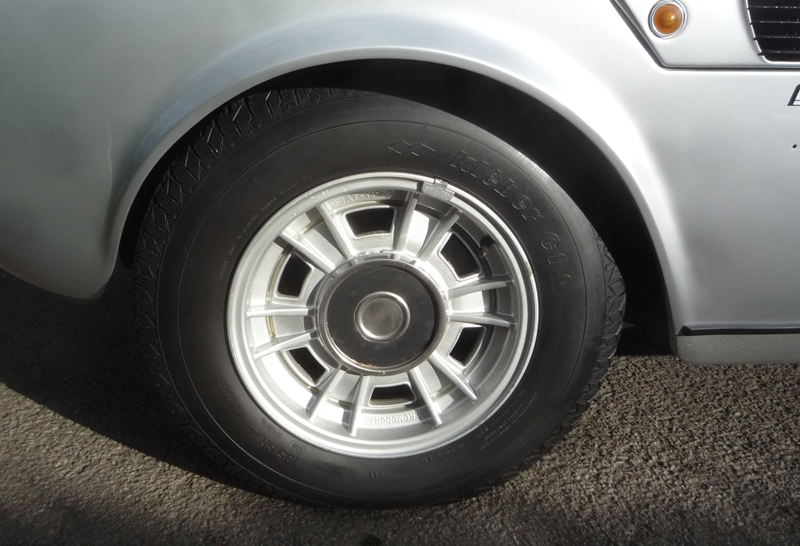 The Cromodora alloys are 14 x 6, tiny by today’s standards. Plenty of sidewall rubber showing, and to absorb the rough spots. And with the later 2.4 version’s independent rear suspension borrowed from the big Fiat 130, the Dino Coupe supposedly rides quite nicely, and makes a pleasant Grand Tourer. This example was at Bob Marcherione’s Sports Car Shop getting its Ferrari badges replaced with Fiat ones, and being prepped for a sale on Ebay, where it fetched about $18k. Needless to say, I fell in love with it all over when I first saw it, and my enabler/life partner was almost encouraging me on. But when Bob offered to drive it across the street for me for some curbside shots, all the blipping and smoking from the exhausts gave me the willies. No, I don’t have the time to learn how to keep three double-barrel Webers synchronized. Pass. But not without some minor pangs. And those were evaporated when I tried to get comfortable behind the wheel. Maybe a Marlin makes more sense after all, especially a six cylinder version with a one barrel carb. Good thing you were able to resist. Italian cars are like mistresses. Amen, Paul, you dodged a bullet. 18k would do more good burning for heat. Someone with long arms and short legs (like myself) would fit right? GAWWD I WANT. That means I too would fit perfectly in this car, just like the rest of my family and pets, Lawrence. D*MN I REALLY WANT ONE OF THESE SOOO BAD!!! I’m pretty sure there’s an 8V at the Blackhawk museum (there was one the last time I went) and I’m planning a visit soon. Not exactly “curbside”, but I’ll try to get some decent pics. What a fantastic car. A real beauty but I think the running costs would keep me out of it even if I fit. 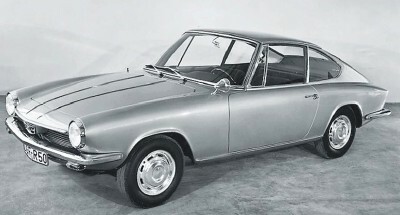 Probably a Fiat 124 Coupé makes more sense if there is any left. My sister’s buddy had a brand-new Fiat 128… cute car… but all I remember was how it was always breaking down… luckily, she had my sister as a best friend (sis owned a new Toyota Corolla!). The Honda s600 was produced from ’64 and the s800 from ’66 and either would rev higher than the Dino. Your mistake was in trying to get comfy behind the wheel. You don’t have to drive it , just looking at it is enough to justfy the price. Wrap it up nice Ill have it very nice car and obviously styled by somebody who knew what they were doing it gives the marlin a hearse like profile in comparism, it must be the fault of your site Paul old Ramblers are coming out of the woodwork on our local auction site but no Fiat coupes yet, This car would make the school run much more entertaining.I wonder if Sergio still makes parts. Wow! Can I pass the hat? Just sell off a few houses. You know you want to. If you want all of the Fiat issues, none of the Prestige, and some of the styling cues at about 1/3rd the cost you could go get a Vega.. But there are guys who know how to do a V8 Vega swap in their sleep. So they got that going for them. True. That is a scary ride for sure! 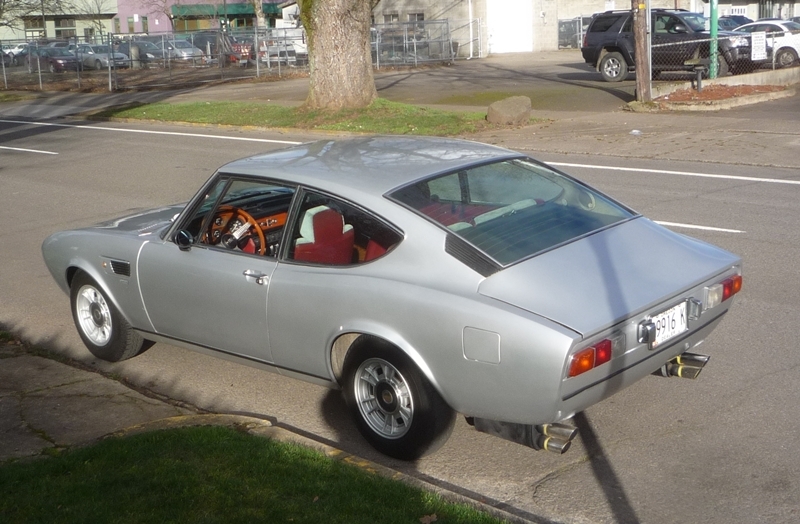 The only reason to do a V8 Vega swap is if you can’t find a ’75 Monza fastback V8. Which might actually be the case, although it’s getting to be a long time since I’ve seen either a Vega or Monza on the road. I’ve seen a (V8 from the sound of it) Monza within the past year or two IN THE RUST BELT! 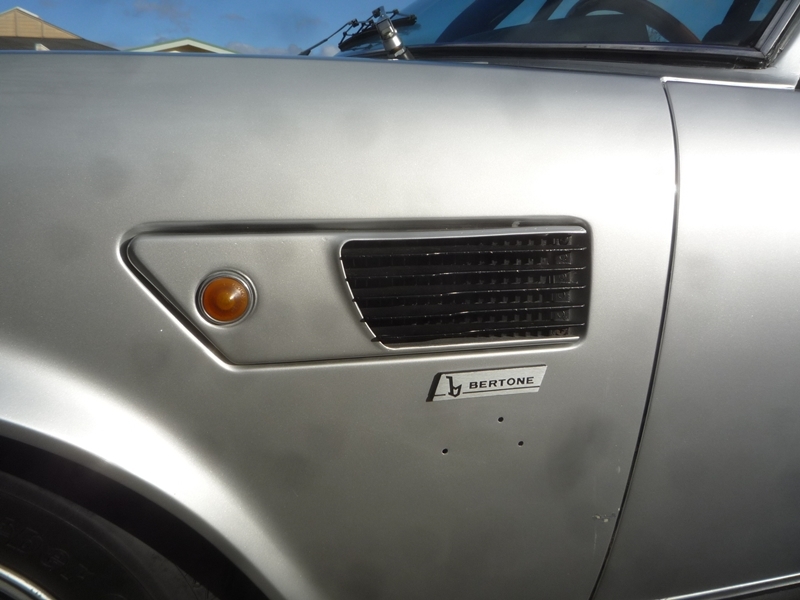 Which is both shocking and suprising knowing the Monza’s tendencies to rust like her step-sister, the Vega. Not here the only Vega for sale over here has a collectors price tag and yep its only a Vega The littleFiat 850 coupe looks like a dino that shrank in hot water but I remember those too well they had flow thru ventilation ie thru panels. you would not dare wash one. I would imagine a Vega over there would command a hefty price tag. For me, the only Vega that’s not a just a Vega is the Cosworth. I wouldnt mind a vintage Fiat like the GT above. I’d probably have to leave the midwest to maintain it though. Are you referring to the Fiat 850 Moretti? I’ve never seen one in real life, only in photos. It looks like a miniature Ferrari. You can do a google image search for Fiat 850 Moretti to see some photos of it. I still drool a little when I see the photos and can only dream of ever owning one. Never seen one for sale either, so I might have to settle for the Fiat 850 Racer instead. Honestly, you must be joking??? A Vega and the designs from FIAT are miles appart. The Vega is without any elegance in comparison. 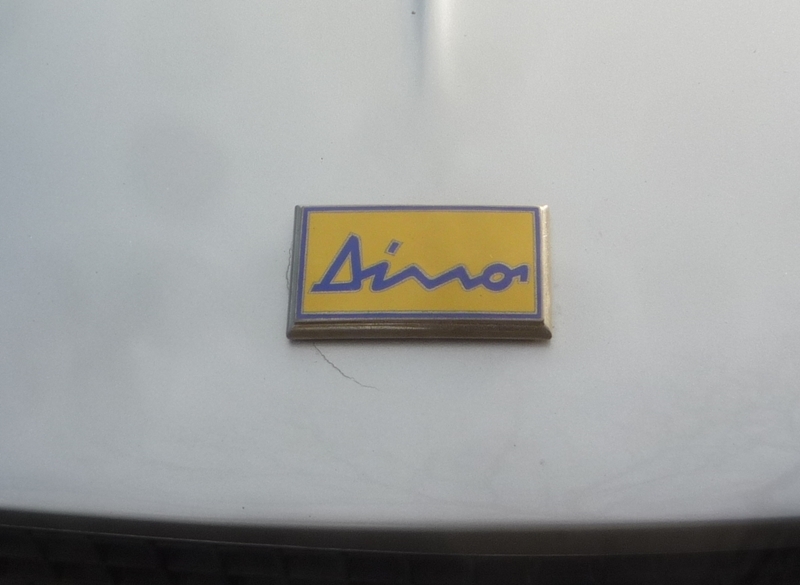 I love love LOVE the entire Dino line of cars and lament the passing (fumbling) of the brand. I’ve never seen one of these in the flesh, but have drooled aplenty over the Spider and 2X6 series. In fact I even had the chance to drive a 246 last year. It was awesome. As for the origin of the fastback I have to point you further back than 1963, to the 1961 New York Auto show where the E-type Jaguar was unveiled to American buyers… and the GM folks flew in the Corvette team to make sketches of the sleek cat. A year later the new Corvette appeared. chuck; in no way was I implying that the Dino represents the origin of the fastback. In the US only. Please re-read the opening paragraph. Paul, I think you mean Neapolitan wood-fire pizza. The closest you’ll find in Nepal is probably chapati! Paul sorry for the threadjack but with all this talk of pizza…. Next time youre up in PDX, check out Apizza Scholls on Hawthorne. Im originally a Jersey kid so when I say this pie blows everything else up here right out of the water and stands firm with NY/NJ pie….I know what Im talking about! My recommendation is spicy Italian sausage and hot cherry peppers. There was a Ford Torino fastback in the late 60’s that I thought was good looking, quite similar to the ’67 Mustang fastback. 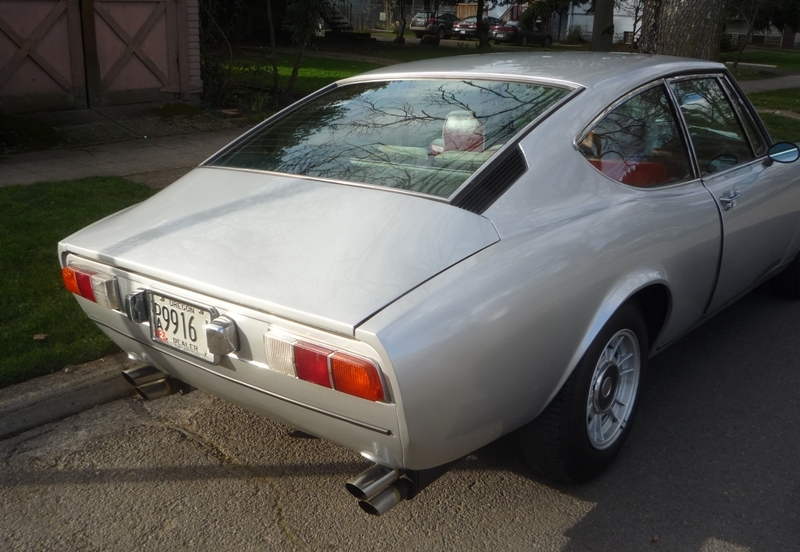 I was thinking about writing in about the Fiat Dino Coupe after seeing your analysis of the AMC Marlin yesterday … How nice of you to notice! I have been looking at my 67 Coupe since 1979 and have yet to tire of the simple but nuanced design. Not a bold narcissistic presence but very elegant and stylish. Swoop the lines of the Fiat up a few notches and you just may notice the tight family relationship this car has with the Lamborghini Miura … Its all there! But that is a bridge beyond time, distance, and space from the Marlin. Good lord. A Fiat Dino? I can’t believe you found one in Eugene of all places. I have relatives in the Willamette valley and will have to spend some time in Eugene when I get the chance, just for the cars. Another illustration of just how tasteful a silver fastback looks when a contrasting (in this case mostly) red interior is used. Classic and traditional: silver/red. I saw in person last June at the Arapahoe Concours in Denver a red Spyder. First time I’d seen one and the proportions were just right and I like it better than either sibling. Those wheels, on the Eugene car and the Denver show car – wow! Love the dashboard layout. With one glance, you can see the speedo, the tach and the little gauges that we sometimes ignore to our own peril. 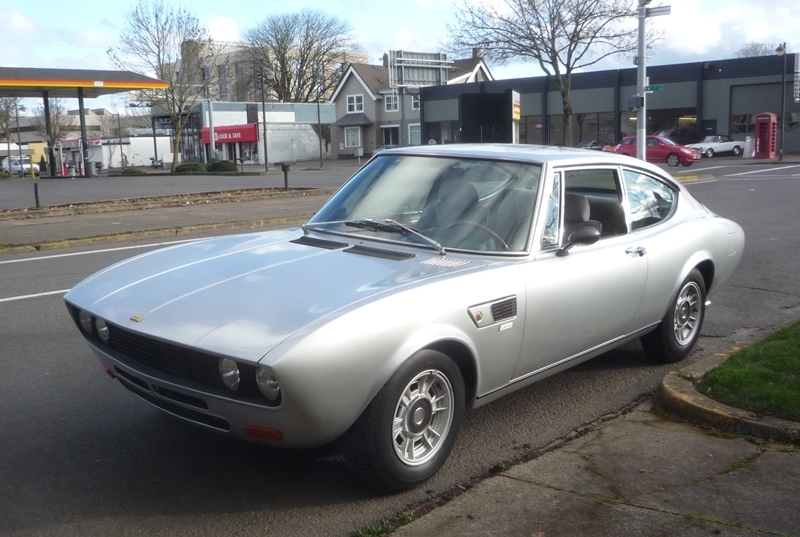 The other Ferrarina, the ASA 1000, was a Bertone creation but looked remarkably similar to the Glas. Not a big fan of the Dino coupe, although it does look better without bumpers. When I turned 16 in 1969 my first car was a 65 Marlin. My father owned a paint and body shop and had found a low mileage Marlin that needed a paint jobs and interior detailing. He bought it about a month before I turned 16 and did a very nice factory color two tone paint job, white over blue. Had the car mechanics checked out and the interior cleaned and polished. The day I got my license (in a 1960 Cadillac Fleetwood, parallel parking that with a Florida state trooper sitting next to me writing stuff down is enough to make any kid blow the parking test) somehow I passed and as mom was driving home I noticed a car parked in front of our house. Of course it was the Marlin, gleaming in the Miami sun. As mom parked my dad came out and said he needed a ride back to his shop and tossed me the keys to my first car, the Marlin. 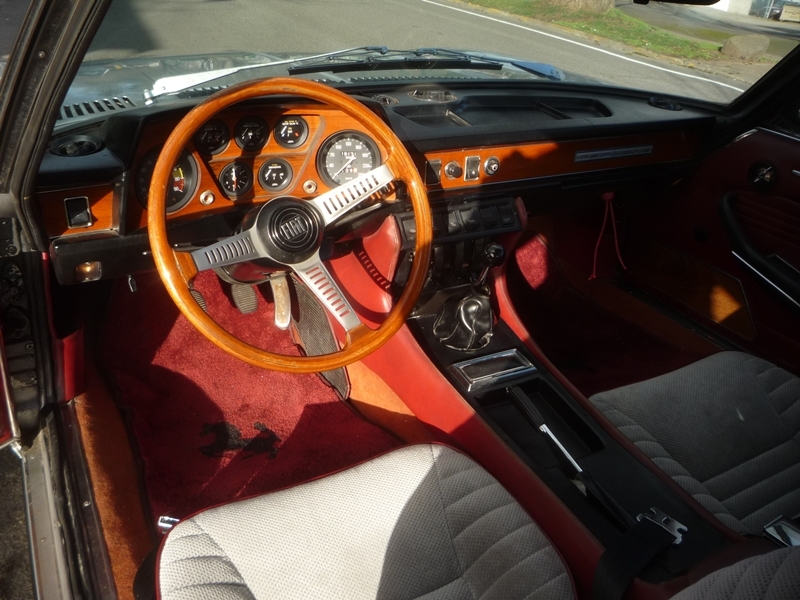 I was in heaven, AMC 327 V8, 4 bbl carb, AC, power disc brakes, white interior, engine turmed dashboard. Oh yeah, the 327 was rated at 270 horsepower. It may have been out of proportion, turning a mid size Classic to a fastback but to me it was perfect. Tire smoke was just a little more pressure on the gas pedal and it was built like a tank. No matter how much a 16 year old male tried to kill it it never broke down. At the time I thought it looked like the 67 charger. 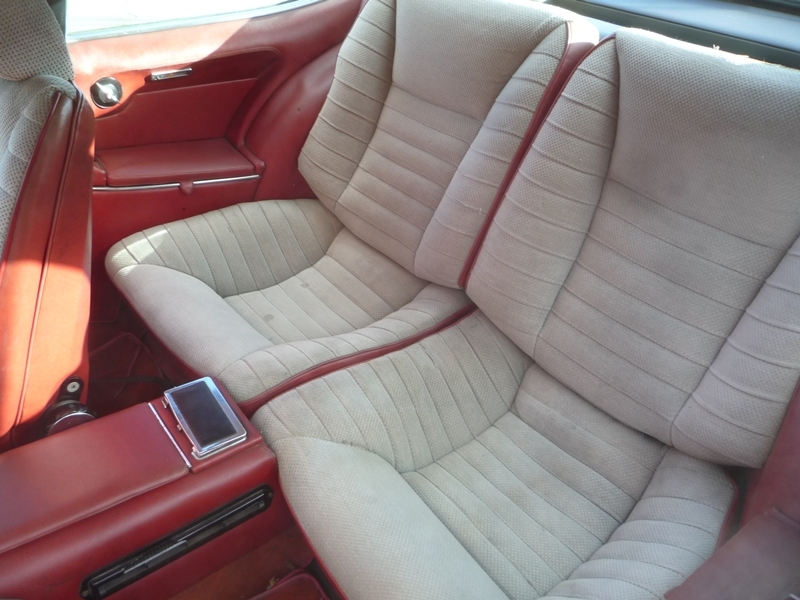 And best of all it had the front seats that would fully recline to the level of the back seat, instant bed. So next time you want to mock the Marlin and it’s odd looks there are a few of us who thought it was the best car I ever had, until I bought my second car, a new Plymouth product. I saw one of these at a show last weekend. Now I know what I saw. And who could forget the Dino that Raf Vallone rode around in in the original “The Italian Job”. Yup, I knew I recognized this car. Gorgeous ride, for sure. And while 6-spoke wheels aren’t usually my bag, those Cromodora mags are WAY cool. Well I feel like a noob.. this is an old article re-posted. Look at the dates for most of the comments. 2011. Oh well, still a good read. Thanks, man. Even as a repost. 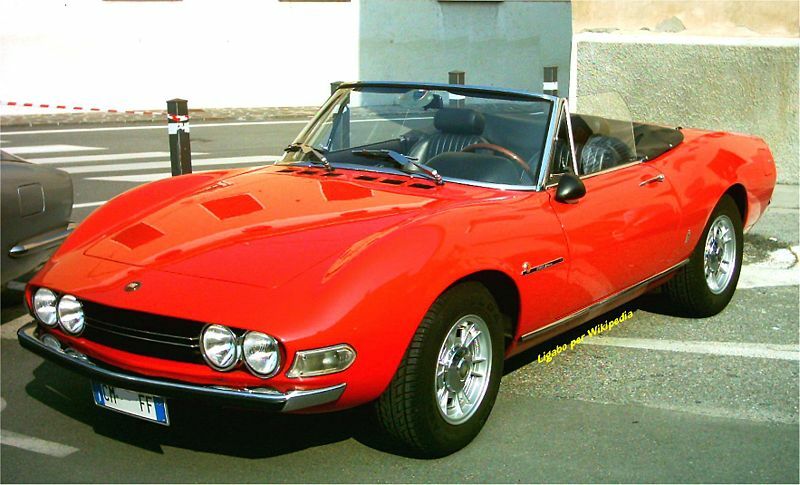 The Fiat Dino Spider and the 206/246 are in my top five favorite cars that I never owned. But these two I had to walk away from in the early 80s. Easy to buy at the time. Tough to own. I’ve never come that close with the other three. The early 80s were the automotive bad old days, so it was heartbreaking to pass on both. I remember there was a guy who drove a black one. He ordered an Aston Martin bulldozed off a cliff. It used to bother me that I knew a guy that bought these cars in great condition just to harvest their gauges, switch-gear, and light housings for Ferrari restorations and treat the rest as scrap. Then I read that line about American pizza and started laughing.